Bone Building Formula™ contiene calcio y magnesio, que junto con ejercicio regular y una dieta saludable, ayuda a los adolescentes y las mujeres adultas jóvenes mantener buena salud ósea. * Apto para los vegetarianos. INSTRUCCIONES: Tome 5 cápsulas por día con comida o como lo indique su profesional de la salud. 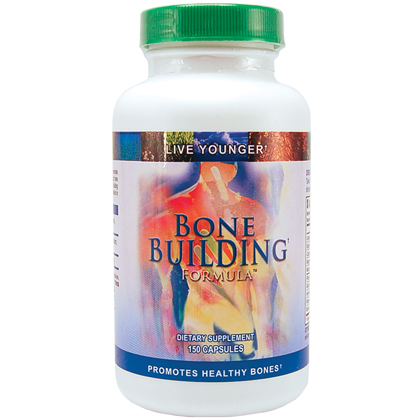 Bone Building Formula is a great addition to any nutritional program. It contains calcium, which, with regular exercise and a healthy diet, helps people of all ages maintain good bone health throughout life. Bone Building Formula also contains magnesium, which is an essential mineral involved in more than 300 systems in the human body; including bone formation. * Suitable for vegetarians. Each capsule contains: 4 Minerals bone formation (calcium, magnesium, manganese, boron), 3 patented mineral amino acid chelates (calcium, magnesium, manganese), and 3 activators aging (vitamin D3, horsetail, Rose Hips). * DIRECTIONS: Take 5 capsules per day with food or as directed by your health care professional. WARNING: If you are pregnant, nursing or taking medication, consult your doctor before using this product. KEEP OUT OF REACH OF CHILDREN.